On a battlefield of white paper, the intent to mark squares off against nihilistic erasure. The background machinations of process are manifest as historical constructions feeding a line of driving desire. Cameron Robbins constructs systems that are at once sculptural outcomes – beautifully produced constructions in their own right – and the procedural impetus for creative outputs. His artworks are pieces of art that also produce pieces of art. He is equal part orchestral conductor, amateur engineer and weaver of networks. Cameron seems to have a grasp on the chaos of nature, corralling it into established parameters for the purposes of artistic exploration. I half expect he might keep mini-tornados in his pockets which he brings out to set inside glass tumblers at parties. This mini-retrospective at Stockroom Gallery brings together work produced in places as diverse as Norway, Mt Jim on the Bogong Alpine Plains and China. Dominating the gallery space is a large kinetic sculpture, in the centre of which is this pitched battle between pencil and eraser. At one end is the driving force of production, at the other is the driving force of destruction. Cogs, motors and belts drive long wires and provide the energy for these forces. Their frenetic duelling on the central field of paper is a wild dance, randomly choreographed and choreographed randomly. The assembled nature of the systems at play imbues the piece with historical character and draws in a web of references from school room experimentations to Richter-scale force monitoring; from puppetry to robotics. Equally captivating is the sound produced by this piece – looping scratches and rhythmic scrapes make this just as much musical instrument as visual sculpture. Around the walls of the gallery are a variety of works that encompass photography, drawings and smaller sculptures. What is always at the heart of Cameron’s work is force and energy. Given the constancy of such things he finds ways to momentarily contain them, capturing them in circulatory confinement. Repetition, vortices, cycles. One series of works comes from a trip into the Bogong Alpine Plains to a site called Mt Jim, where a geographical anomaly causes variations in magnetic readings. 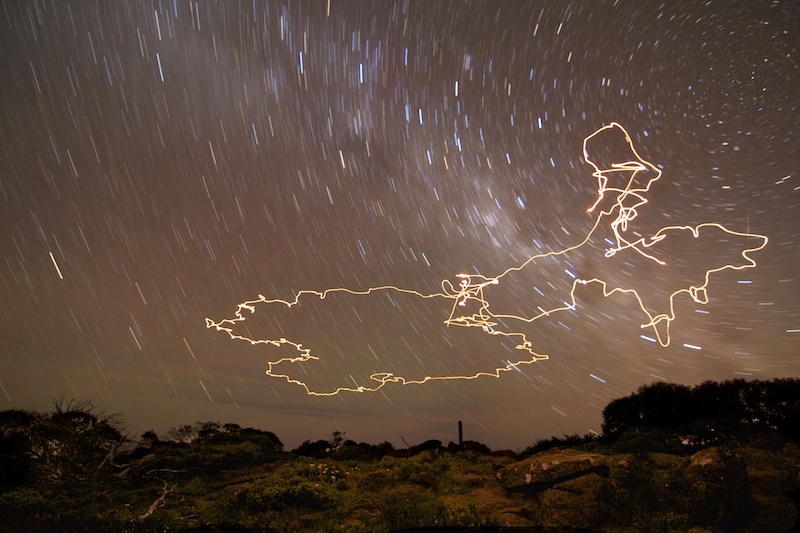 Cameron has produced two gorgeous long-exposure photographic ‘night drawings’ alongside some other sculptural works that evoke a sense of complete intellectual immersion in the exploration of a natural environment and phenomenon. These works reveal a driven curiosity and a desire to learn performatively. The artist is working out his understanding of place through the act of making a response to his attraction to it. There’s something wonderously engaging about this and it makes the work vibrant with its own internal energy that partners the natural energy of its subject. This show is a rare opportunity to get a look at a broad body of Cameron’s work in the one place. There’s so much to see and so much to be inspired by and enraptured in. With a large installation currently in at MONA and inclusion in the fantastic Vitamin series of art books (Vitamin D2), Cameron’s own magnetic field is a potent force in its own right. Take a day trip – it’s that good. Tags: Cameron Robbins, Stockroom Gallery. Bookmark the permalink.